Movies and TV shows come and go on Netflix on a regular basis, which means you might be half way through your favorite flick when it gets yanked from the service. The solution? Buy all your own content and set up your own private cloud-based streaming service you can get at from any computer or device. 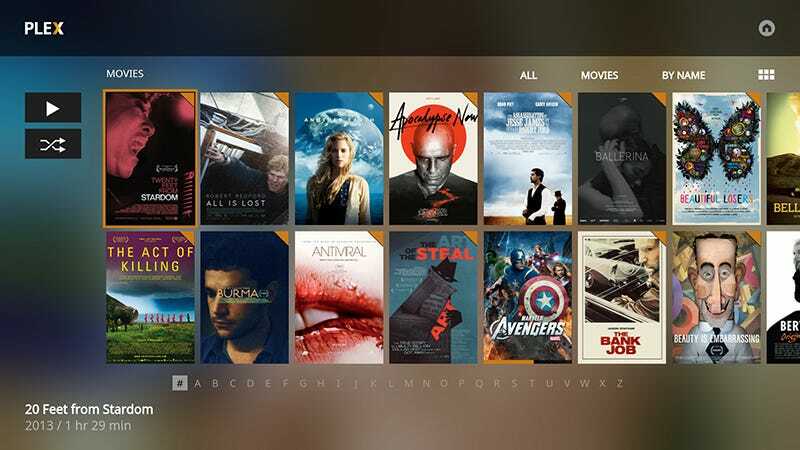 The stand-out contender here is Plex, which we’ve recommended before. It’s new Plex Cloud service, now in beta, lets you use an Amazon cloud locker to store all your movies and shows and stream them from anywhere. Previously, you had to host the files yourself, so that meant leaving a computer or network drive switched on all the time to get at your content over the web. With Plex Cloud that’s no longer necessary, though you do need to pay for a Plex Pass (from $4.99 a month) and sign up for some Amazon storage (it’s $59.99 a year for unlimited storage). We’ve included a couple of other options if you’re not taken by Plex Cloud. They’re not quite as Netflix-like as Plex Cloud, but if you already pay for storage on these services then they’re good alternatives to consider. All these services require you having your movies and shows in a popular, DRM-free video format first, and we’re not going to dig to deeply into that here (though if you’re looking for a decent converter then check out Handbrake). It’s important to note that while many people consider it fair game to rip media they’ve already paid for to be able to watch the contents anywhere they like, check your own conscience and national laws before proceeding. We can’t guarantee any of these services will turn a blind eye to copyright-infringing material, so proceed at your own risk (and pay for your damn movies!). Plex was already a decent option for building a Netflix of your own, and Plex Cloud makes it even better. You simply upload everything you have to Amazon’s servers, and Plex pulls it down from there. You need to pay up for unlimited Amazon storage (or settle for the 5GB you get with Prime), then get a Plex Pass, and then wait in line for the Plex Cloud beta. You can upload your videos through the Amazon web interface or via the desktop apps (you need the desktop clients for files above 2GB). With all that done, you get a new Plex Cloud option when you log in, and it works in a very similar way to setting up your own server. Point Plex towards the movies and shows in your Amazon locker, and it organizes them into a library for you. You get the option to automatically binge-watch episodes one after the other, thumbnails and metadata pulled from the web, and an intuitive interface to keep track of what you’re watching and what you haven’t yet seen. With a Plex Pass you can get at your library from any web browser as well as through the official apps for Android, iOS, Apple TV, PlayStation, Xbox, and just about every other media device known to man. Google Drive lets you store pretty much any file you like in the cloud, including common video formats, which it plays in YouTube-style windows. You get 15GB of space for free, which you can up to 1TB for $9.99 a month or 30TB for $299.99 a month (see the full pricing list for more options). Files can be uploaded via the web interface or through the desktop clients for Windows and Mac systems. Apps for iOS and Android let you get at your movies and shows from anywhere, and you can sync files for offline watching on mobile devices if you’ve got a long flight or a weekend in the woods planned. Google Drive lacks the intuitive media center-style interface of Plex Cloud, and it’s not really built to be a Netflix clone (so it won’t remember where you’re up to in each episode and so on). That said, this is Google, so the cloud storage and sorting features are all simple to use and rock solid in terms of stability (you’re unlikely to get connection issues). The easiest way to use it is just to set up folders for all your movies and shows and then use Drive’s top-notch search capabilities to find what you want to watch next. Dropbox, like Google Drive, isn’t set up to provide a Netflix-like experience in the way that Plex Cloud is, but it will play your movies and shows directly from the web. If you’re going to go beyond the rather paltry 2GB of space you get for free, you need to stump up $99 a year or $9.99 a month for 1TB. Of course Dropbox is about much more than playing your media files. It’s a good option if you already use it for file syncing and backups, and it can easily keep your library synced across multiple machines without breaking sweat. For watching on the go there are mobile apps for Android and iOS and if you’re going to be without Wi-Fi for a while then you can easily save movies and shows to the local storage and watch them offline. It’s the least suitable option in our list for creating your own Netflix, but it’s the best way of keeping a local media library synced across multiple computers and devices. You can even use Dropbox to back up your iTunes libraries as well, playlists and all, if you’re prepared to go for a Pro account.